When life gets too structured I like to travel and explore with no agenda or research, to find what is there to find. As I’ve gotten older I am not a collector of postcards, but roam the back alley for texture or sit in a park and watch it become a cinema. It is a hot July day when I arrive in Birmingham, Alabama, slightly more than two hours from my home in Tennessee. I take the second exit into downtown. One that does not have a cluster of drought-tolerant shrubs as gateway, or any brands beckoning their low-rent concierge. There’s nothing much as I put on the brakes, only the familiar path of dark concrete winding in a bell curve toward near-burnt grass. Eventually I see one modest house near the edge, the sign of old abandonments the interstate brought to every Southern town. A block or two further and there are other remnants of a neighborhood. And then the city opens up to me, with its skyline industry graying in the distance, and those immediate bright blooms of crepe myrtles planted with intentionality. They must be a better price point than an actual tree. I pull in a lot gridded like a city map with sneeze weed and flea bane struggling in the asphalt cracks. Next door a church gleams. The neon corner sign of the 16th Street Baptist Church catches my eye as vintage artifact. Slowly, details are disappearing from our first- and second-ring neighborhoods. Slowly, towns’ personality becomes a blank stare with fewer neon winks. Before the narrative unraveled for me from history, I was initially taken in by the church architecture. Perhaps others have this reaction with any holy place, and maybe that is the power of good design. This church came with a trinity of domes. I turn around to take in the view of the park across the corner, a context I had driven past to find parking. Across the grassy lawn and shade were glimpses of public art, scattered about as if children had left toys strewn in a yard. It’s summer after all. I walk closer to explore the church’s imagery where familiar narratives are framed in stained glass. Sheep, angels, a pastoral scene. I head up the front steps. An older couple, seemingly reluctant to take on the climb, ask me to let them know if the church is open today for viewing. Seems they’ve just arrived too, are from somewhere further South, Montgomery. I am greeted at the landing with a series of locked doors and spare them the pointless sojourn. They find for us all a workaround, the basement door as the public threshold. If I was mindful, this would have been foreshadowing. We go in together to a large room where the story of 1965 seems on one hand incredible to fathom, and on the other a thread that runs through current news out of Baton Rouge, St. Paul, and Dallas. Inside the church basement, men in red polo shirts sit in a line of chairs like Deacons waiting on someone to approach an altar. And we’ve all come to them in search of some blessing, they must figure. There is a small long room with glass windows that reminds me of a concession stand, inside is a wall of black and white historic images. One man in a red shirt is speaking to his small audience, his voice is mute, glass between us. I think I know the story he is telling and move on, seeking out some grandeur of a sanctuary. One of the men directs me to the narrow stairwell of red carpet. He tells me to hold the rail. When he steps back to his other duties, I pause and take a photo of the contrast of bright walls and red steps. ‘The way is narrow,’ someone said, and I am surprised by this awkward design. Then it begins to register that this is not the main entrance, but a pilgrim’s back way, an escape for children who had sat still as long as they could. I arrive, with little transition, to the clearing of the sanctuary, a half-moon theater of walnut pews, red carpet, and bright glass. The interior is so familiar to me, having been baptized twice as a child, once from peer pressure and once from some longing that seemed to require a rite of passage or immersion. I stand at the back of the sanctuary, taking in the breadth of this grand canyon of a place. I see the table carved with the phrase, ‘In Remembrance of Me’ and then look up to see the black and white photograph of four girls projected high on the walls from some unseen source. The beautiful girls flank the gold organ pipes that line up like a card of new sewing needles. They served as bookends to the large-print-edition Bible on the pulpit, center stage. Upon looking at the images, I felt something I had not felt before that moment–a weight. I can only describe this weight by stating the symptoms we read online of a heart attack. My back ached. My arm felt as if a clot would not allow its lift. I could not seem to cross my heart in any pledge, or genuflect. An arrhythmia formed inside of me. Everyone in July of 2016 will look back on this hot summer with some perspective we do not now know. Two weeks ago many of us did not skip a beat at life. Yet this week many of us have written President Obama’s prepared words from a memorial service into our journal. His reflective voice a bridge between those who write on their wall that ‘Jesus died for everyone,’ meaning not just any one, and those whose invisible rosary holds each beatitude like a bead if not a pearl. They mumble ‘blessed are the poor in spirit’ and have their doubts. I no longer attend the Baptist church where I grew up, where my Aunt taught Sunday School with felt boards and images. I have a string of Baptist perfect attendance medals in a cotton-lined box that speaks more to her faithfulness than mine. For many years, I’ve come to find sanctuary in the Episcopal Church, with its weekly breaking of the bread and shared cup. A few years ago, I became official–‘confirmed.’ But the Baptist Church had laid a cornerstone for me, one that I sometimes had met with a chisel in my hand and a desire to reform. At 16th Street Baptist Church I took a seat in a pew mid-way down. It came with no kneeling hinge or Book of Common Prayer. At my seated knees was a shelf where the white cover of The Baptist Hymnal leaned toward me with gravity. It was facing me along with a Bible, the same translation ‘awarded’ to me in a Primary Department with my maiden name inside in calligraphy in 1966. Beside the bookshelf was a smaller ledge with seven or so round, die-cut, empty holes to hold the separate glass communion cups each quarter. I had not seen that artifact in years. You could say ‘separate cups’ was something preached to me growing up in the South in the 1960s, even as ‘desegregation’ was a spelling word where most of us transposed letters in my public school. We now know spelling should not even be a separate subject, but learned within a whole, a context, a reading that requires we bring our full selves to any text. A woman in camouflage pants and tank top wrestled a vacuum cleaner and a snake of chord, while I sat quietly in my pew. My presence did not startle her or slow her pace. She was expecting me. She went about her work. The static of the machine was a stirring sound that was comforting. I did not want to particularly be alone in a large empty room with pink carnations in the altar vase arranged like a funeral spray. Her work reminded me that this is an active church with services end of week, not a museum. Her work provided an echo to the radio static I had found all the way from Fort Payne to Birmingham. I was traveling between stations. Before leaving, I want to walk up to the altar, to see the red ribbon in the book. I find instead a crumpled white linen handkerchief to the left, a cut-glass stemmed goblet for water to serve the preacher’s voice. Together, the three objects reminded me of the water cycles we drew in elementary school when I was the age of four young girls named Addie Mae Collins, Carole Robertson, Cynthia Wesley, and Denise McNair. I had to refer to the church brochure to write those names, and not misspell them, the way I once did ‘desegregation.’ Their four names were never celebrity. I linger a few moments in the church and take my leave. As I pass back through the basement, I pause at a glass museum cabinet that can barely contain the replica of a slave ship. Inside the boat, hundreds of small bodies made of clay line the floor in perfect symmetry, like communion cups and unopened books. In another section of the hull, the artist had depicted a huddle of contorted bodies and I look away, then step away. I cannot bear the weight and feel a little dizzy. On another table display was a large red oil lamp and I remember my grandmother had one just like it for emergencies that rarely came our way. It stood alone, without a mate, like a widow. It stood on the table in front of a silk banner printed with a portrait of MLK. A Deacon wearing a red polo stepped into the glass room to talk with those listening. Those photos would have told me what I might witness if I had the will to listen. But I didn’t and wanted to leave without taking such a communion, without offering a donation, without slipping a prayer into the box at the back of the sanctuary. Outside the sun was shining. Perhaps it was also shining on Sunday, September 15, 1963 at 10:22 a.m. I walk at an angle to a city block that frames a circular path. In front of me are four girls on a bench forever posed in bronze. A fifth figure, a living black woman sits between two of the girls with her pocket book on her lap. I want to take her photo but she has moved before I even make the gesture, wanting to be polite. She offers me her seat. She has been expecting me, like the other woman vacuuming the church. I’ve since read that more than two million pilgrims have traveled to this park since the Birmingham Civil Rights Institute opened in 1992, right across the street. I take a photo of the four girls. The one perched on the end of the bench is leaning into the difficult words in her holy book. Two other girls balance her on the other end of the see-saw-like scene. One has slipped off her tight Mary Janes, and the pair of shoes sit just below her, casually, as if we could reach down and pick them up or help adjust the buckles. One shoe holds a puddle of recent rain. The size 6x shoes offers a sparrow a drink, and clouds and a canopy of trees are mirrored there–a universe. The barefoot girl is tying the sash of her best friend, and her long locks remind me of Cinderella from a storybook. Close by, the fourth girl is forever animated in a dance with doves. The doves break the reality and move me to metaphor, and metaphor is sometimes distancing. I follow the circular path to the next vignette. Two children pose defiant. This is a study in contrast. ‘I ain’t afraid of your jail’ is interpreted by a pedestal plaque titled, The Childrens’ Crusade. My first thought reading the title had nothing to do with violence, because I have had the privilege of lingering in a different world. As children, we collected coins in small, plastic church banks for someone named Lottie Moon in China. My civic engagement ended there. My thoughts then move to the felt boards where a boy with a slingshot slays the giant and grows up to become a king, because it paid more than poetry. I think of Bible Sword Drills we were taught to stay sharp, where we competed on stage to be the first to find scripture verses in a book the size of a dictionary. I did not, in my white privilege, imagine the connotations of a water hose that stripped the bark off trees and shredded a girl’s pleated skirt. I did not imagine the Public Safety Commissioner rounding up children in school buses for the jail. I did not fear any dog, except one that a neighbor had made mean as an extension of his own bitterness. In the park, a man pushes his bicycle slowly toward me, his right arm in a sling and swollen slightly. He has lost all symmetry, what with his wound, and the bicycle he is guiding by hand like a child. He is coming to talk to me, as if he has been expecting me. He becomes my docent. ‘Did you read this?’ he asks. I had not read past the title, being a poor student of history, like many. I make my confession. ‘I lived just down the street,’ he says with an authority, as he points to a place he alone can still see. He continues with his story. ‘I was six. It shook our house. It made this sound...’ he said and continued into a contortion of vocal sound effects. The ‘it’ of course is the white elephant in every room, a bombing by the Ku Klux Klan. He moves his left hand from the plaque to reveal a phone number tourists can call for more information, if we want to hear a story. ‘Go ahead, call the number and listen,’ he says. I type in the number on my iPhone and a serious voice begins telling me a story, but, then so is the man standing right in front of me. My new friend continues to share with me and asks me where I’m from. He shows me his sore arm and says he has two metal screws holding it together. He is nearly a sculpture. He assures me that life is better than it was. His story turns back quickly to the street where we are standing. ‘You have to realize, there were houses all around here, all the way down the street.’ He nearly says ‘my’ street but hesitates. He has a larger story than his to tell. “Imagine school buses lining up to arrest children. I’m talking boys and girls–to take them to the jail.’ His good strong arm overcompensates for his other one–and my ignorance–and moves again to the interpreter’s offering, to the photo on the plaque of a boy looking back at us through chain link fence. A crowd of other classmates are shoved up against the child in the photograph. There is no recess. I never listened to the recorded story from the plaque, but chose instead one I could not fact check, but only internalize. My docent instructs me to turn around, away from the two defiant children that tower over both of us. He shows me a symmetry I had missed completely, cropping the artist’s intent. There is a bookend sculpture standing like a window with bars across the sidewalk from the two children who aren’t afraid. ‘Look up,’ he said and points to a different kind of Letters from a Birmingham Jail than I had processed in college. The letters for ‘D E S E G R E G A T I O N’ were written upside down on the jail wall because the young foot soldiers knew they were marching in a world that was not accurately reflecting their inalienable rights. For these young foot soldiers in the Children’s Crusade of 1965, the world was upside down. The Children’s Crusade was not a part of history I had come to know, not a story retold to me. Instead my public elementary school took us on field trips in the other direction. I went many, many times to the Hermitage home of Andrew Jackson in Nashville, and came away with an empty lunch sack. I learned that Jackson owned several horse hair couches that were seen but kept out of reach to us. I remember stopping at Stuckey’s on the way for a pecan log and a Coke. I remember taking in landscape through the school bus window that proved that change is slow. There were no signs that interpreted Andrew Jackson’s full story at his white house. The Trail of Tears had not yet been labeled. Somewhere I still have a postcard featuring a portrait of Jackson and another of his wife Rachel, thinking even then about hinges, book spines, and symmetry. I’ve kept them some thirty years to remind me that a postcard souvenir is something cropped, something the visitor’s bureau wants us to see. Somehow, even until this week, I had not sorted out the history of police dogs and fire hoses used to deter protesters in the 1960s. Seems I had morphed all scenes into one event somewhere far away. I never really knew how seminal Birmingham’s youth were to the Civil Rights movement. Yet, it happened this way, a mere two hour school bus ride away, and in the opposite direction from Old Hickory. The year 1965 was before I started first grade. I had read and written about Letter from a Birmingham Jail, that famous letter MLK penned on April 16, 1965. I never knew exactly why he found himself there, satisfied with abstract answers. Even Reverend King gets cropped and framed as some solitary lonely statue, some lonely man out on a back balcony. In Birmingham, he stands in the center of the park on a pedestal that no one can sit down beside, unlike the scene with the four young girls who were also victims of a hate crime. MLK was in Birmingham that spring of 1965 training families and children in the steps of civil disobedience, in working as a group, lifting their voice to sing, in knowing that segregation is something to overcome. And maybe someday we will. The Children’s Crusade was a victory for Birmingham’s civil rights leaders in May of 1965. From May 2 to May 10, the world watched as groups of youth and their leaders pressured the Mayor and other elected officials to desegregate the city. During those nine days, hundreds of children were jailed and held in makeshift detention centers, injured by an assault of batons, pressure wash, and dog bites. A circuit court made protest and picketing illegal and justified arrests. After each arrest, however, other groups of youth stepped up, because thousands of black youth were trained in nonviolent civil disobedience in church basements and fellowship halls. The youth proved to be good students of the future. The images of the police directing water hoses like assault weapons ‘went viral,’ along with the photographs of police dogs on a short leash gnashing their teeth. I saw these images in the abstract isolation of a page. But the other side of the railroad yard had its own movement, too. Their training program was also held in church basements and among certain deacons. The KKK was mobilizing in Birmingham. By September of 1965, they were crossing lines of civilized society like any other terrorist organization. They planted an arsenal of bombs and terror in a room that held the same stack of Bibles as theirs. Their bomb exploded, killing the four young girls and injuring at least twenty others. Terror requires a long recovery, I am reminded as I listen to a six year old’s story from the point of view of a middle-aged man. We all stay close to our stories, tending them like fires. Perhaps the closer we can get to someone else’s story the better. Years ago this Baptist boy was in Birmingham sipping from a small cup and turning his hymnal to “Onward Christian Soldiers.” The song surely conjured up an entirely different set of connotations in his imagination than mine in rural white Tennessee. I write this essay perhaps to dwell a bit longer, to linger closer to his story and his fire. I have been so cold. I continue along the circle in the park, a place of great clarity that quickly pulls you to the center of all things, not a normal labyrinth with mysteries. The path in Kelly Ingram Park covers four acres and five decades. It is named Freedom Walk and is situated directly in front of the Civil Rights Institute that opened in 1992. 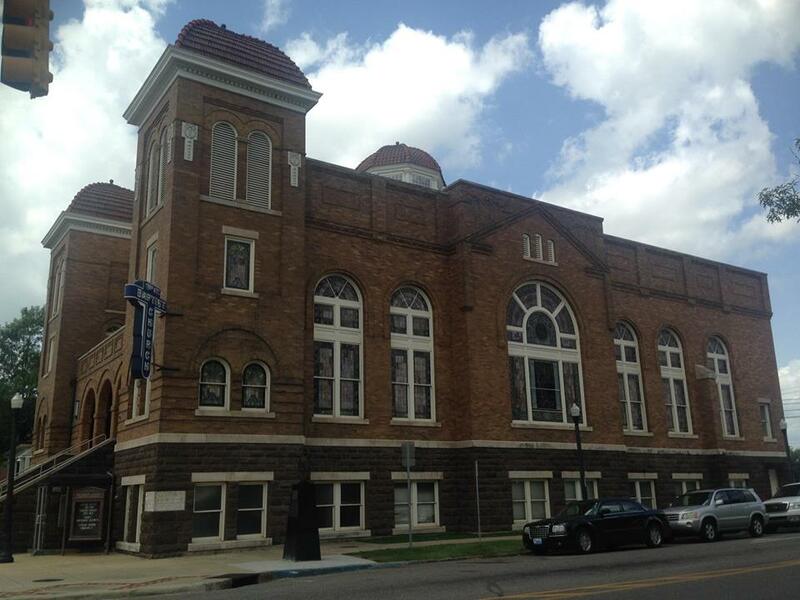 The Institute’s mission is to recognize Birmingham’s place as the “cornerstone” of the Civil Rights Movement and its citizens instrumental in the Civil Rights Act of 1964. The circle of the freedom walk is endless. Halfway along my emotional first orbit, I come across an elderly couple sitting on a bench relaxing near sculptures that interpret the water hoses and agitated police dogs. The couple smiles as I circle closer to them, and, as we say in the South, I “speak.” The older man with a cane becomes my second exit. ‘I was a foot soldier,’ he says like a decorated Veteran. I nod in recognition of the new story we can share. The Freedom Walk in Birmingham offers the same imagery of the Cherokee sacred symbol, a circle that never ends. Every building has a story and every park. Every community, every city block, and basement. The public realm is a place with many utilities. The most important one is becoming a safe place where the docents of history pass along what they have witnessed, what they had the courage to change. Laurie Perry Vaughen grew up in Chattanooga and now works as a book editor for a publishing house in Nashville. She will graduate in May 2018 with her MFA in creative writing from the Sewanee School of Letters. She holds a degree in sociology and an MA in English from UTC. She has published two chapbook collections of poetry, What Our Voices Carry and Fine Tuning. She has been the recipient of the Greensboro Review's Amon Liner Award at UNC Greensboro and the James Dickey Poetry Award through Lullwater Review at Emory University in Atlanta. Her performances have been featured at Georgia Center for the Book in Decatur and the 2016 Word of South Festival in Tallahassee.